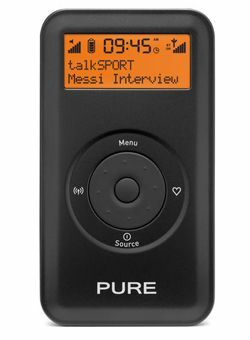 Pure unveils Move 2500 pocket DAB radio | What Hi-Fi? Due on sale tomorrow at around £90 is this iPod-esque Move 2500 pocket DAB radio from Pure. Following on from the PocketDAB 1500, the Move 2500 is said to give up to 14 hours playback from its Lithium ion rechargeable battery. It can be recharged via the supplied mains adapter, or through the USB port of a Mac or PC. It's slimmer than the older model, and Pure says it has improved the audio quality with a series of equaliser settings so you can tweak the sound. You also get DAB+ – handy if you're abroad on holiday, but of no use in the UK – an FM radio and silicon-tipped noise-isolating earphones. Other features include a black-on-orange backlit LCD display, 10 digital radio and 10 FM presets and a USB input for firmware upgrades and power.